THE federal government has suspended taxpayer funding to a union charity after it was ­revealed a Palestinian organisation receiving aid employed a second member of a listed terrorist group. Union Aid Abroad - APHEDA, which was set up by unions and has been run by federal Labor MPs including Ged Kearney, has received $21 million of public funds, millions of which has made its way to a Palestinian organisation called the MA'AN ­Development Centre. 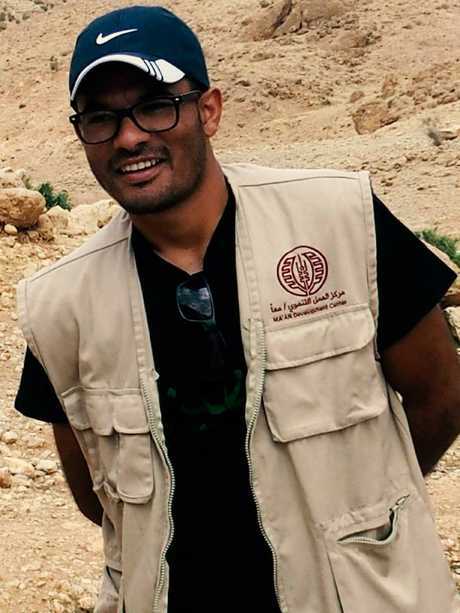 The Daily Telegraph can reveal the MA'AN Development Centre is employing as a field and media co-ordinator, Hamza Zbiedat, who is a supporter and affiliate of terrorist organisation, the Popular Front for the Liberation of Palestine (PFLP). The PFLP is on the official terror list of the US, the European Union and Canada, as a result of its history of hijacking of planes, assassinations and suicide bombings, while Australia has the group on its "Consolidated" list of organisations subject to financial sanctions as a result of terror and security threats. 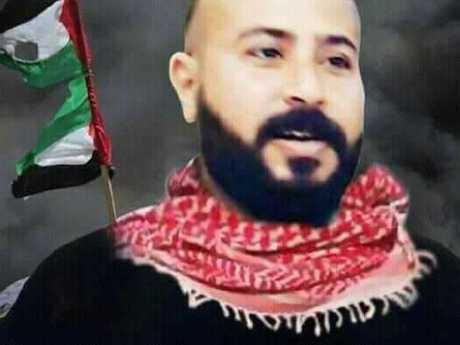 Zbiedat, who was arrested by Palestinian Authority secu­rity forces on October 14, 2017, is the second PFLP affiliate employed the MA'AN Development Centre. 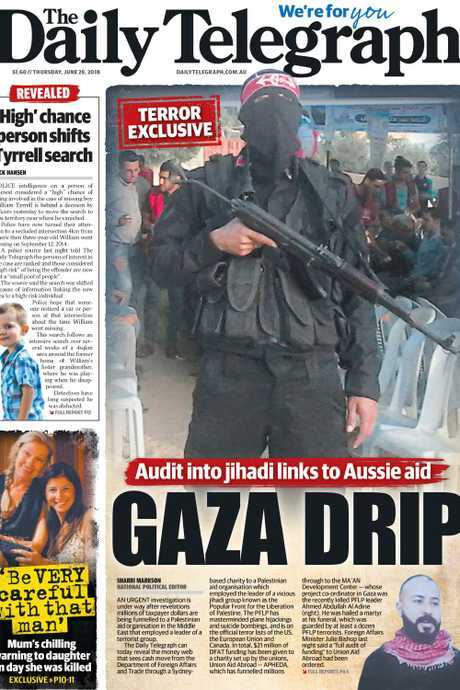 In June, The Daily Telegraph revealed the same org­anisation had employed since 2012 a leader of the PFLP in Gaza, Ahmad Abdullah Al Adine, 30, as their Project Co-ordinator and Field Monitor. 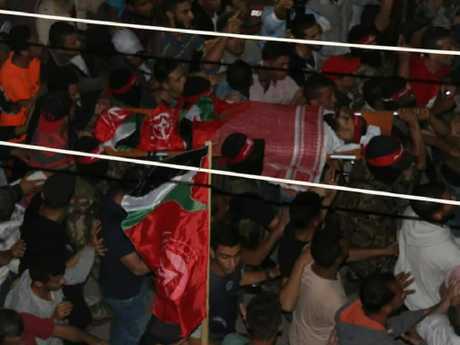 He was killed during the protests at the border of Gaza and Israel in May and he was hailed as a "martyr" at his ­funeral, which was attended by at least a dozen armed PFLP terrorists wearing balaclavas. The government requires NGOs, like Union Aid Abroad - APHEDA, ensure that their partners, like the MA'AN ­Development Centre, do not provide direct or indirect support or resources to individuals associated with terrorism. Ahmed Abdulla Al Adine’s body is carried during his burial as he was hailed as a “martyr”. After being alerted to the evidence by The Daily Telegraph, the government has now suspended all Australian funding to the Labor-aligned charity. In June, former foreign minister Julie Bishop ann­ounced an audit into the funding, but did not suspend it. 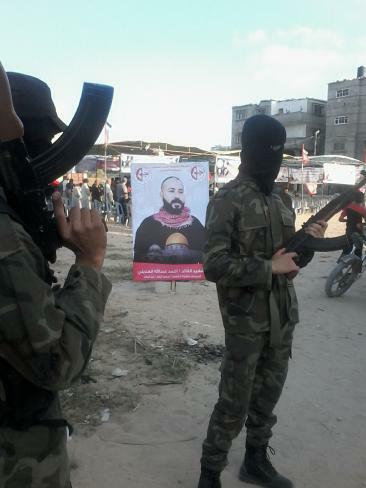 At least a dozen armed PFLP terrorists wearing balaclavas attended Ahmed Abdulla Al Adine’s funeral. But shown the evidence concerning a second current employee, Ms Bishop, in one of her final acts as foreign minister, halted funding to Union Aid Abroad - APHEDA. "The former Foreign Minister initiated an audit of APHEDA's Australian aid-funded program in the Palestinian Territories on 27 June. "The audit is due to be completed by the end of the year," Foreign Minister Marise Payne's spokesman said. "The former foreign minister suspended APHEDA's Australian aid-funded programs in the Palestinian Territories until the audit is complete. "The Australian Government has zero tolerance of any diversion of aid funding from its stated development purpose." 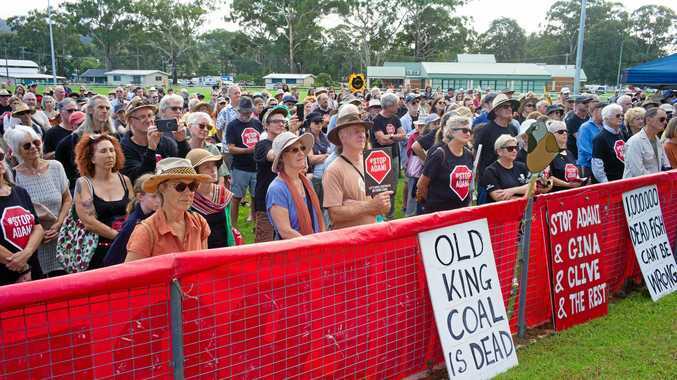 Union Aid Abroad - APHEDA's executive officer Kate Lee did not respond to questions about whether she had made any moves to investigate links between MA'AN Development Centre's staff and terror organisations since The Daily Telegraph's first ­report in June. The Daily Telegraph’s exclusive report in June. Ms Lee would also not respond to questions about whether it was appropriate funds went to an organisation that employees leaders and affiliates of a terror group. She said only that the two employees had never worked directly on Australian projects. "Mr Hamza Zbiedat is not nor has he ever been employed on our project in Palestine," she said. "APHEDA and our partner organisations comply with DFAT's due diligence ­requirements concerning projects administered as part of Australian aid program." Australia/Israel and Jewish Affairs Council executive ­director Colin Rubenstein said he welcomed the move to suspend the funding.